The Hadith of Gabriel (ḥadīth Jibrīl) is one of the most important and popular Hadīth (report on the words and actions of Prophet Muhammad) in all of the Hadith literature. Its narrative contains the best summary of the core of Islam: the "Five Pillars of Islam", the "Six Articles of Faith", and Ihsan, or "doing what is beautiful". Timing wise this hadith occurred about only 80 days before the Messenger passed to the unseen world and narration wise it is narrated by one of the closest companion of the Prophet, Umar ibn Khattab, the second khalifh. This Hadīth is found in both the Ṣaḥīḥ al-Bukhārī and the Ṣaḥīḥ Muslim, making it one of the most reliable narration. Hadith of Gabriel holds a special position and Muslim scholars showed their unique juristic acumen by naming this hadith the Hadith of Gabriel. This is because this hadith is not about what the companion of the Prophet who narrated from the Prophet but about what the Sahaba narrated from archangel Gabriel. It is also one of those unique hadith where the Archangel Gabriel assumed human form and manifested himself before not only the Prophet but also his companions. While we were one day sitting with the Messenger of Allah, peace and blessings of Allah upon him, there appeared before us a man dressed in extremely white clothes and with very black hair. No traces of travel were visible on him, and none of us knew him. He sat down close by the Prophet, peace and blessings upon him, rested his knees against his knees and placed his palms on his thighs, and said, O Muhammad! Inform me about Islam." Muhammad said, "Islam is that you should testify that there is no deity save Allah and that Muhammad is His Messenger, that you should perform salah (ritual prayer), pay the zakah (alms), fast during Ramadan, and perform Hajj (pilgrimage) to the House (the Ka'bah at Makkah), if you can find a way to it (or find the means for making the journey to it)." Said he (the man), "You have spoken truly." We were astonished at his thus questioning him and telling him that he was right, but he went on to say, "Inform me about Iman (faith)." He (the Messenger of Allah) answered, "It is that you believe in Allah and His angels and His Books and His Messengers and in the Last Day, and in fate (qadar), both in its good and in its evil aspects." He said, "You have spoken truly." Then he (the man) said, "Inform me about Ihsan." He (the Messenger of Allah) answered, " It is that you should serve Allah as though you could see Him, for though you cannot see Him yet He sees you." He said, "Inform me about the Hour (time of the resurrection)." He (the Messenger of Allah) said, "About that the one questioned knows no more than the questioner." So he said, "Well, inform me about the signs thereof (i.e. of its coming)." Said he, "They are that the slave-girl will give birth to her mistress, that you will see the barefooted, scantily-clothed, destitute shepherds competing in constructing lofty buildings.." Thereupon the man went off. One day while the Prophet was sitting in the company of some people, Angel Jibreel came and asked, "What is faith?" Allah's Apostle replied, 'Faith is to believe in Allah, His angels, (the) meeting with Him, His Apostles, and to believe in Resurrection." Then he further asked, "What is Islam?" Allah's Apostle replied, "To worship Allah Alone and none else, to offer prayers perfectly, to pay the compulsory charity (Zakat), and to observe fasts during the month of Ramadan." Then he further asked, "What is Ihsan (perfection)?" Allah's Apostle replied, "To worship Allah as if you see Him, and if you cannot achieve this state of devotion then you must consider that He is looking at you." Then he further asked, "When will the Hour be established?" Allah's Apostle replied, "The answerer has no better knowledge than the questioner. But I will inform you about its portents." "When a slave woman gives birth to her master. When the shepherds of black camels start boasting and competing with others in the construction of tall buildings. And the Hour is one of five things which nobody knows except Allah." Shaykh Hamza Yusuf in one of his lecture beautifully explained that from the Hadith Jibreel we can see a multi-dimensional aspect of the Deen. 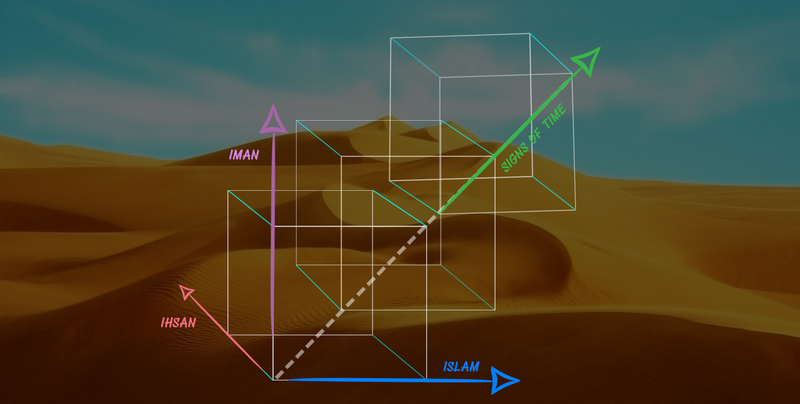 The horizontal dimension is Islam - consist of behavior, outward activities. These are Pillars or Foundation. Dimension of Body. Islam comprises of the 'what' or 'actions'. The vertical dimension is Imaan or faith, the reason behind the behavior, its focus is towards heaven and hence its the vertical dimension. These are Articles of Faith. Dimension of Mind. Iman comprises of the 'why' or 'purpose behind the actions'. The third dimension or Ihasan gives you depth, the ultimate beauty and aesthetics of Deen where the focus alone is on God the Supreme. Dimension of Heart. Ihsan comprises the highest motivation of the why. The fourth dimension is End Time and its Signs. 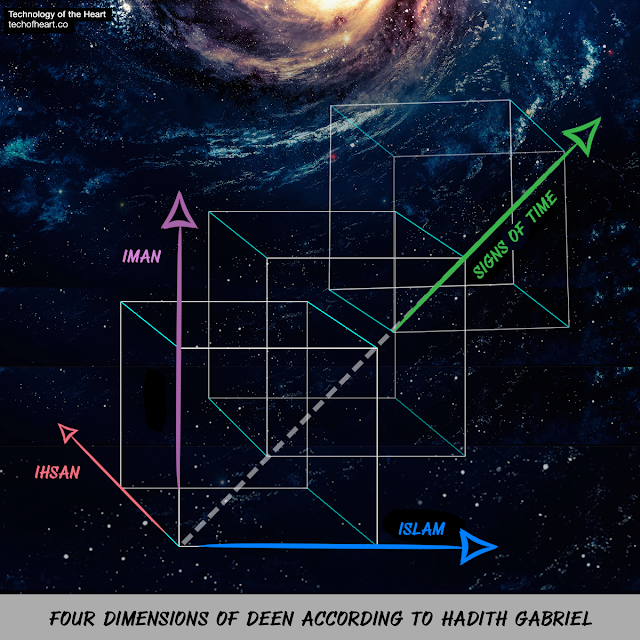 Just like in physical world in additional to 3 spatial dimensions we have time as 4th dimension, so it is for the Deen as evident from the hadith. We are in-time creature. One of the thing we experience in time is Signs. “It was Jibril (Gabriel). He came to teach you your Deen"
Towards the end of the hadith we find that the Messenger is asking the companion about the identity of the person who visited and he narrates that this entire conversion was to teach the Deen (life's transaction, including faith and action). And part of that teaching being End of Time and its Signs - my point is that End Time Signs (Science of Eschatology) is the Fourth Dimension of Islam and Essential part of our Deen. We often find in our time many scholars and teachers of Deen neglect this fourth dimension. They may talk about Islam, then Iman and stop there. People of Tasawwuf will talk about Ihsan and they may stop there. What is left out is the End time and its Signs which according to this hadith is part of our Deen, an essential part. Otherwise Jibreel would not ask about End Time and its Signs and the Prophet would not clarify that these all are about teaching the Deen. We know from the Prophetic teachings that towards the later age there will be many tribulations, trials and tests. If we ignore the fourth dimension of Islam, we will do it at our own peril because then we will expose ourselves to ignorance about the sources and reality of these end time trials and tribulations (fitan). We will also fail to understand the reality of the world and we could easily be taken for a ride by the agents of deception. This is why the study of the Signs of End Times according to the reliable traditions of Islam and its correct and upto date interpretation are important. One of the important things about the science of Eschatology is that as more and more data is available, as more and more new phenomena are now clearer, we can not just rely on medieval interpretation of the End Time Signs, but we have to understand them from the experts of later time or more precisely those who are present among us. There are great experts who are now explaining some of the obscure prophecies and end time signs in a more clear and accurate ways which were never possible before. In a captivating Tradition we witness the Archangel Gabriel appear on the horizon in human form. He approaches the Messenger and sits before him and begins to engage him with questions about the religion. What transpires is that we are gifted an atlas for our deen and a key to navigate our way in this world. But before he departs, he asks about 'the hour' and we are given clear signs of that which will precede it. 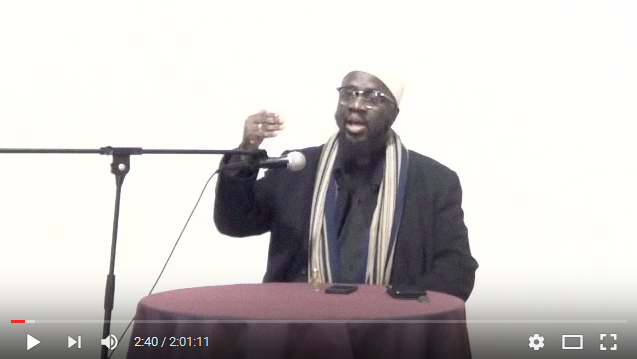 Shaykh Ibrahim elucidates this tremendous hadith. * Jami' al-'Ulum wa'l-Hikam by Ibn Rajab al-Hanbali: Commentary on the Second Hadith of Imam Nawawi's "Forty"
"It was Jibril (Gabriel). He came to teach you your Deen" said Prophet (s) at the end of Hadith Jibril which indicates that Knowledge of End of Time and its Signs are essential part and one fourth of the Deen.